Let’s discuss how irrevocable trusts work. First, an irrevocable trust involves three individuals: the grantor, a trustee and a beneficiary. The grantor creates the trust and places assets into it. Upon the grantor’s death, the trustee is in charge of administering the trust. This means that he or she is responsible for distributing the assets in the trust according to the grantor’s wishes. The trustee has an important job, as he or she must protect the assets. 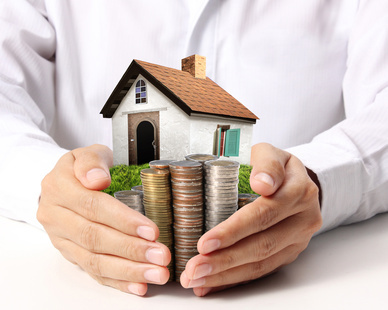 The beneficiary is the person who receives benefit of the assets. Assets placed into the trusts are considered gifts and cannot be removed at a later date. The grantor, however, does have the ability to create the exact terms and rules that others must follow. For example, the grantor may specify that the money placed in an irrevocable trust gets used for a specific purpose, such as for college or a wedding. Protecting assets from judgements and creditors. Removing taxable assets from the estate so that the grantor can take of advantage of estate tax exemptions. For starters, irrevocable trusts can be great tools for estate planning and reducing death tax liability. That’s because an irrevocable trust removes assets from a person’s estate – while the person is still alive. Why would anyone want to do that? Because by doing so, it will remove the assets from getting taken in a lawsuit against the one who had the trust established (the grantor or settlor). This means that the grantor – the person creating the trust – or the beneficiary of the trust won’t have to worry about the seizure of trust assets. Plus, it removes the asset’s tax implications upon the grantor’s death. So, irrevocable trusts protect assets, eliminate probate fees and reduce estate taxes, which is why people use them. As stated, whatever the settlor (the one who created and funded the trust) could do, the judgment creditor can step into his shoes and do, too. Can the settlor freely change the beneficiary to himself and spend all of the money? If so, the judge could order the settlor to change the new beneficiary to the one who just won a lawsuit against him. Then, the settlor’s legal enemy could take the money out of the trust for his own benefit. 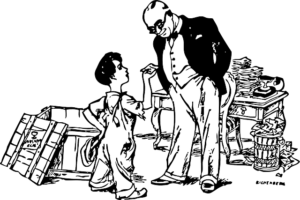 So, since the irrevocable trust limits the settlor’s ability to change the beneficiary, it prevents one’s legal from doing the same. Thus, it is the type of trust utilized for asset protection. Such a trust based in the US is called a Domestic Asset Protection Trust (DAPT). As of this writing there are several states that offer irrevocable trusts for asset protection. They include Nevada, South Dakota, Tennessee, Ohio, Delaware, Missouri, Alaska, Wyoming, Rhode Island, New Hampshire, Hawaii, Utah, Mississippi, Oklahoma, Virginia and West Virginia. Their case law is fairly favorable for those who live in those jurisdictions. However, even for residents, we have seen these types of trusts penetrated for asset protection purposes because the trustees reside within the jurisdiction of the US courts. 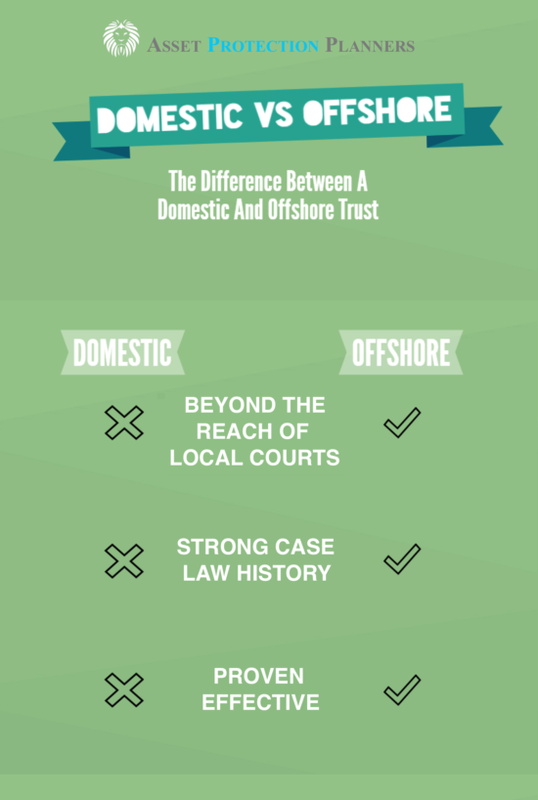 Case law tends to favor offshore asset protection trusts. Offshore irrevocable trusts, step it up a notch. With a trust in the Cook Islands (south of Hawaii) or Nevis (in the Caribbean Sea), you can be the settlor and the beneficiary. These jurisdictions have special laws so that you can still maintain some control, in cooperation with the licensed, bonded trustee, and still keep your assets away from creditors. It is referred to as an Offshore Asset Protection Trust (OAPT). The biggest benefit is as follows. Since the trustee resides abroad, the local court does not have jurisdiction over the trustee. So, the trustee need not comply with foreign court orders. Creditors have to show a court a fraudulent conveyance occurred within specified time frames before a creditor can tap into an irrevocable trust. Trustees in these offshore asset protection trust jurisdictions go through intensive background checks to obtain their licenses. They are bonded by insurance companies to act in the beneficiary’s best interest. A major part of the revenue to these jurisdictions are from trustee services. So, there is a great incentive to keep their reputations in the best of standings. Why use an offshore irrevocable asset protection trust? Quite simple They work. This company has been in the industry since 1994. We have also seen these trusts protect assets in every instance in which they have been challenged. Moreover, we have never seen a trustee in either of the two regions mentioned above perform an act that would improperly cost the settlor or beneficiary a loss of trust funds. Here is a typical scenario when using an irrevocable trust for estate planning purposes. Bill and Mary set up an irrevocable trust. They make their children the beneficiaries. When they die, the children receive payments from the trust. The children may be able to receive a set monthly amount for a lifetime. They may be able to receive enough to pay for a college education. The trust may be drafted so that they can receive the money all at once (not usually a wise thing for a youngster). Or it can specify that they may receive enough for maintenance, support and education. Afterwards, the trust may provide a set amount, say 25, more at 30 and the remaining balance at 35, for example. Bill and Mary may be able to borrow money out of the trust for their own use, so there are ways that they can still have access to the funds during their lifetimes. With an offshore trust in the proper region, Bill and Mary can be the beneficiaries during their lifetimes. Children typically become beneficiaries after the death of both parents. When you have an irrevocable trust created, you must be very sure about what you are doing. There are restrictions on making changes later. However, with most irrevocable trusts, there are often ways that you can modify or terminate them, to a certain extent, with the permission of the beneficiaries and/or the trustee. 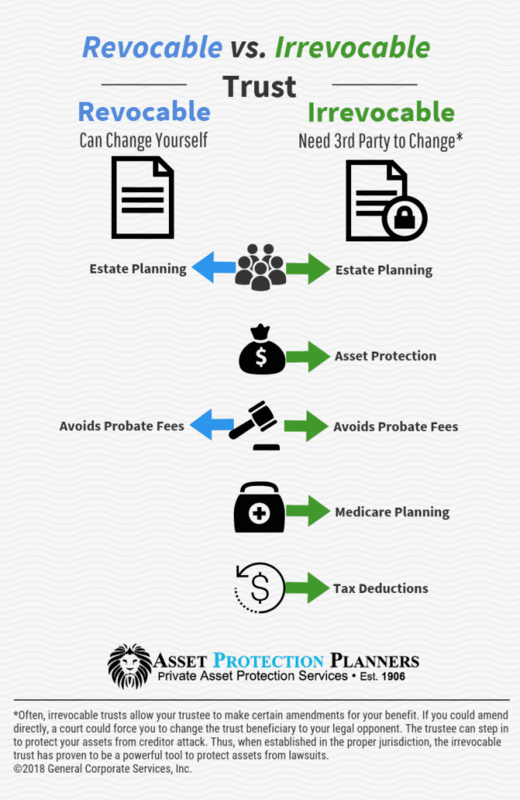 If you’re considering estate planning there are many tools that can help you accomplish your goals. You many want to care for a loved one after your death, make sure the right people receive your personal items upon death or alleviate taxes for survivors. Commonly used instruments include wills and trusts. But trusts have the significant advantage of avoiding expensive probate fees and specifying who gets what and when they will receive it.